Activity Report Vol. 60: Invite Friends Through the Official Otaku Coin App and Get Otaku Coin! 【Postscript added on 28th December 10:30am JST】 Because the number of installations has reached the upper limit, this campaign was ended with the ‘Limited Initial 10,000 Users Campaign’ and ‘3,000 for Free OtakuCoin Campaign’. Please wait for new campaigns in the future! We are planning! We leave the article as an introduction of the contents of the campaign that was held. A Friend Invite Campaign is underway on the Official Otaku Coin App. 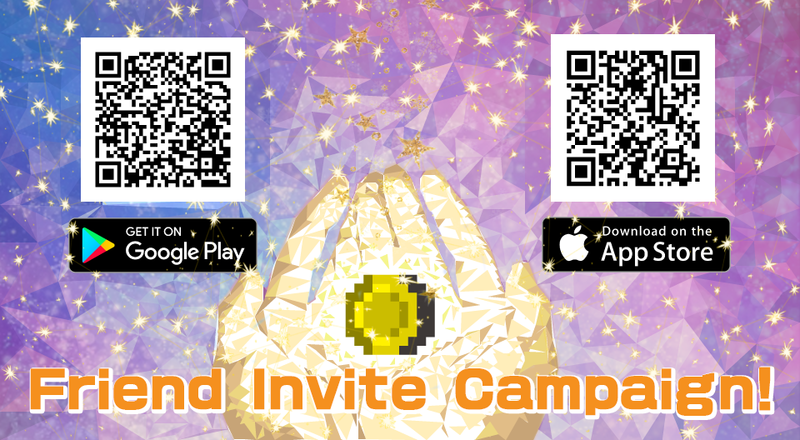 Users can send invites to friends through email or social media by clicking on the invite friend banner on the Official Otaku Coin App home screen and following the instructions to get an invite QR code. For every friend you invite who installs the Official Otaku Coin app form the QR code and completes SMS verification, you’ll get 1,000 Otaku Coin for free! The maximum amount of friends you can invite to receive 1,000 free Otaku Coin is five. Once this number is reached, your invite code with still work but you will not receive any additional free Otaku Coin. Use of the Official Otaku Coin App is initially limited to 10,000 users. Once this number is reached, new users will not be able to complete SMS verification. Users will be notified through an email and push notification once the maximum number of users is increased, at which time SMS verification will resume. For more information on how to use the Official Otaku Coin App and its features, please see the article below. Download the Official Otaku Coin App here! Otaku Coin: directly connecting fans and creators. Follow Otaku Coin on social media!